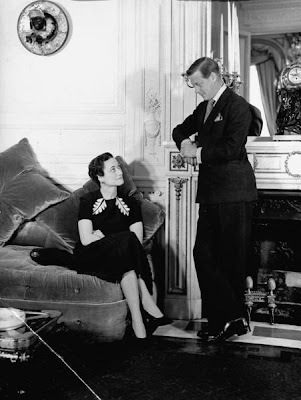 Since some of the Duchess of Windsor's jewels are up for auction again tomorrow at Sotheby's, I thought it might be fun to take a look at one of The Windsor homes. 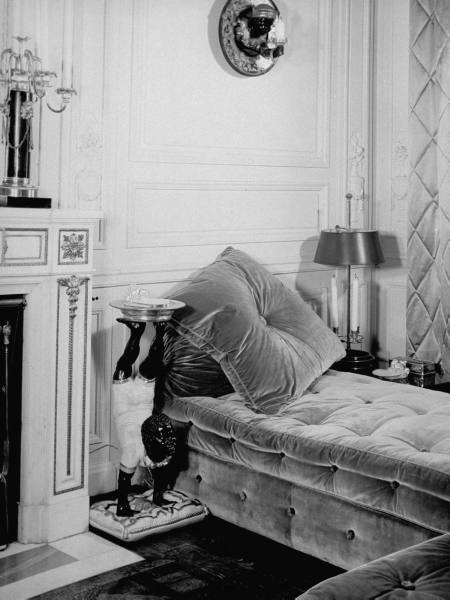 Continuing our French theme, we will first look at 24, boulevard Souchet. 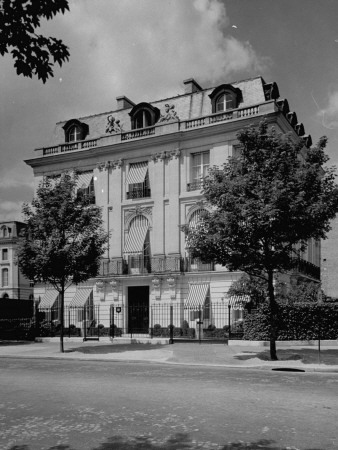 It was a large four story house located in the Sixteenth Arrondissement where they made their home after the abdication. These photos were all taken in 1939 and I found the description of the home in The Duchess of Windsor: The Uncommon Life of Wallis Simpson. 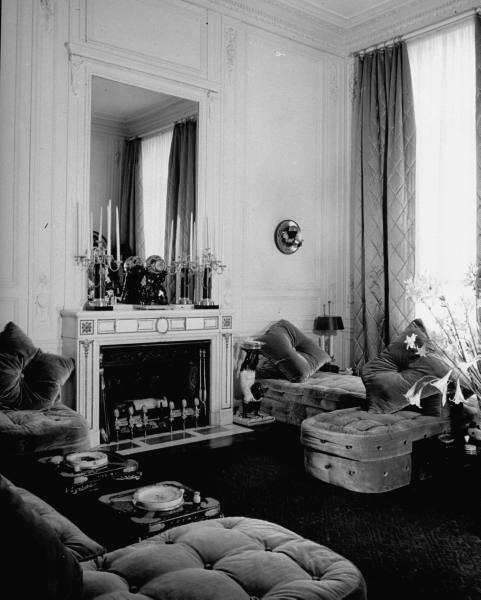 They leased the home that included a small garden until 1949. 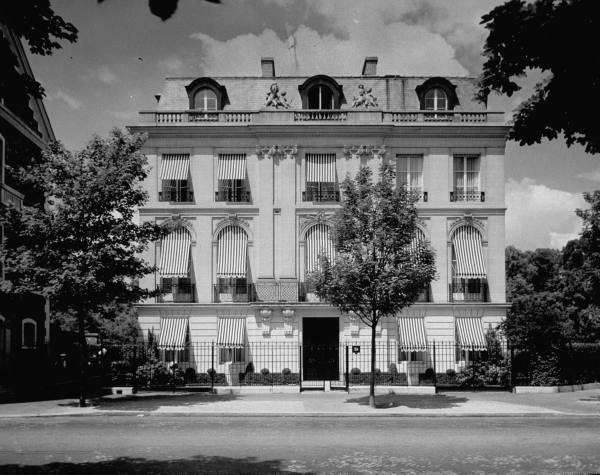 They then rented a house at 85, rue de la Faisanderie in Paris from 1949-1953. 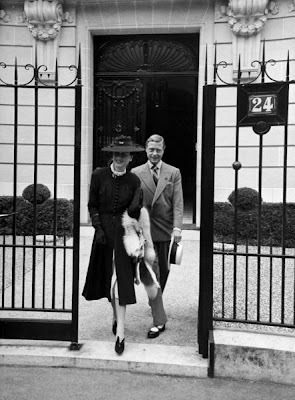 The Duke and Duchess of Windsor. 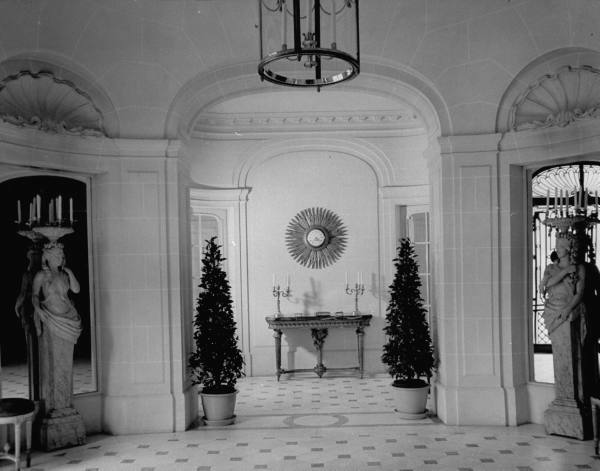 The entrance hall with black and white Carrara marble floor and caryatids wearing crowns of candles. 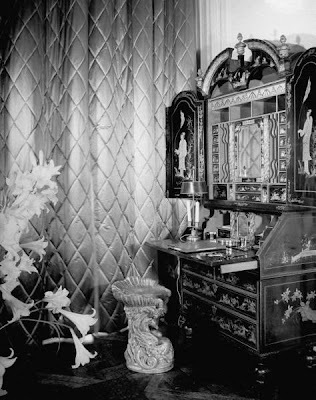 "A Louis XVI clock, whose face was set within the center of a gilded sunburst, hung above an antique gilt console on which stood red and gold visitor's books." 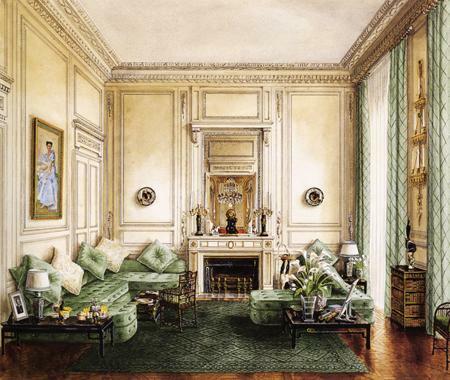 A sketch of the banquette room by Alexandre Serebriakoff. 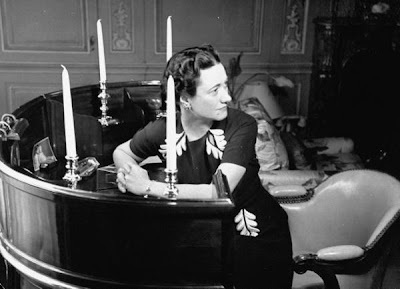 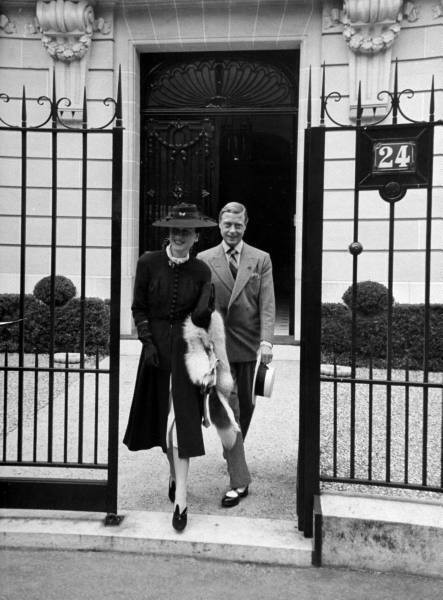 The Duchess of Windsor consulted Stephane Boudin of Maison Jansen and often hunted for antiques with him. The Duke and Duchess of Windsor in the banquette room. 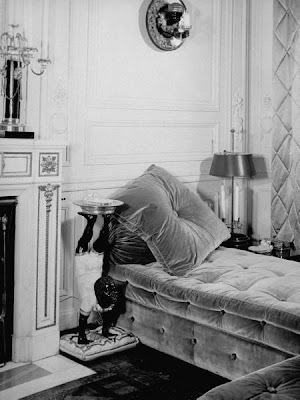 "The banquette room reflected a whimsical side of Wallis's character. The walls were formal, painted white with elegant boiserie, but the carpet was green and white lattice pattern, and the furniture was clearly different: Against one wall stood a large green velvet banquette covered with white and green pillow. 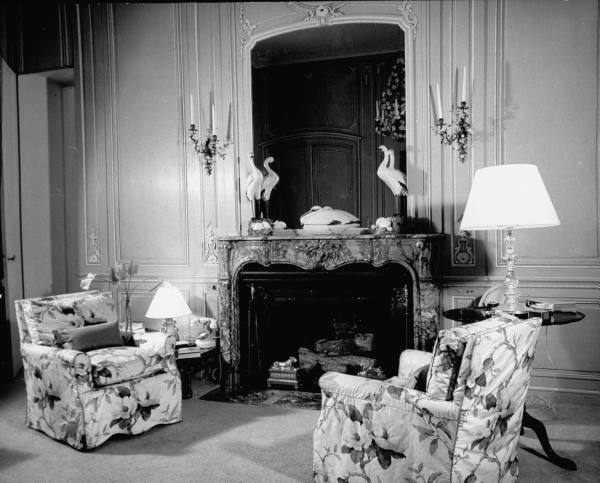 A sofa and matching chairs, also covered in green velvet, stood facing the antique mantelpiece, dominated by an Italian Renaissance clock." A detail of a desk in the banquette room. The Chinese lacquered desk in the banquette room. The white and gold salon. 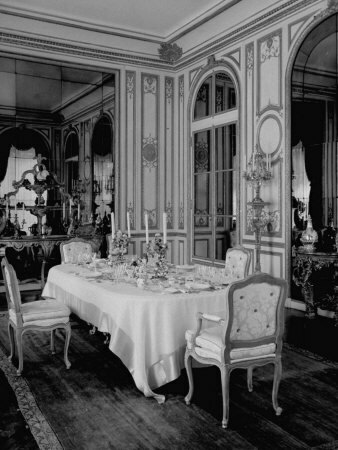 The walls of the dining room were "painted cream, with the delicate boiserie picked out in gilt, and pierced by arched windows draped with crimson curtains tied back and hung with enormous gold tasseled cords at two levels. 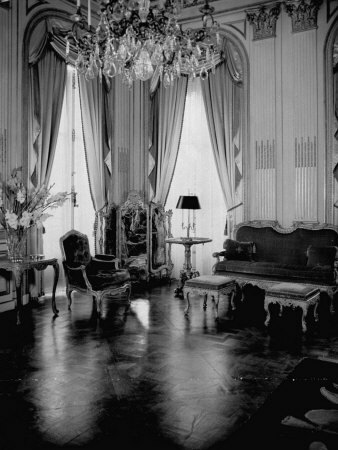 Each window was fitted with matching mirrored shutters on the inside that could be pulled closed to magnify the candlelight on formal occasions - an effect heightened by the immense mirrors that cloaked the doors, stood above the fireplace, and filled the alcove against one wall in which stood the carved and gilded rococo sideboard." 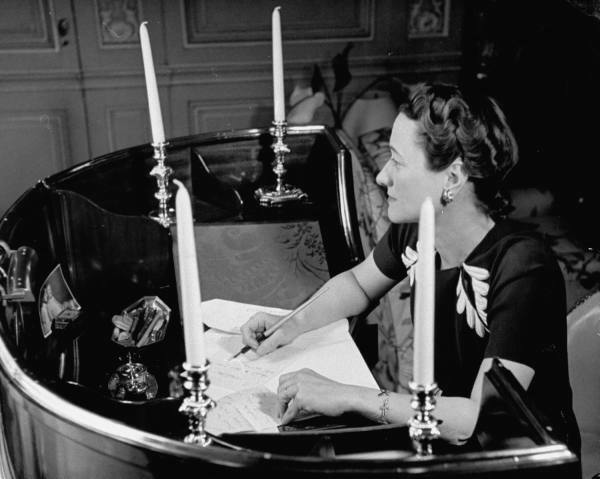 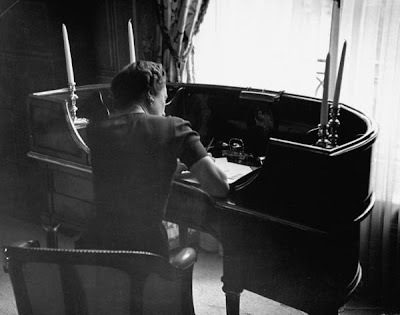 The Duchess of Windsor at her desk in the upstairs sitting room. 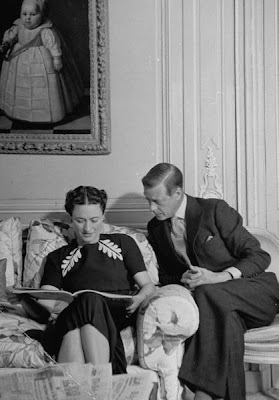 The Duke and Duchess of Windsor in the second floor sitting room. "A large sitting room, decorated with overstuffed modern sofas and chairs covered in bright English chintzes, a Chippendale table, and a crescent-shaped desk used by the Duchess separated the Windsors' rooms. 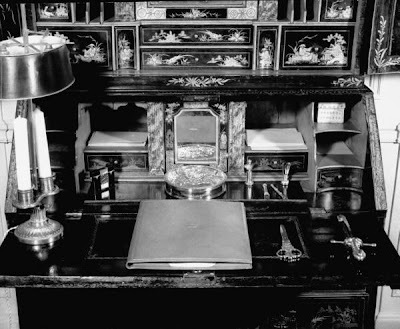 It was used for informal, private entertaining; on occasions when the Duke and Duchess were alone in the evening, the dined here at the small table." 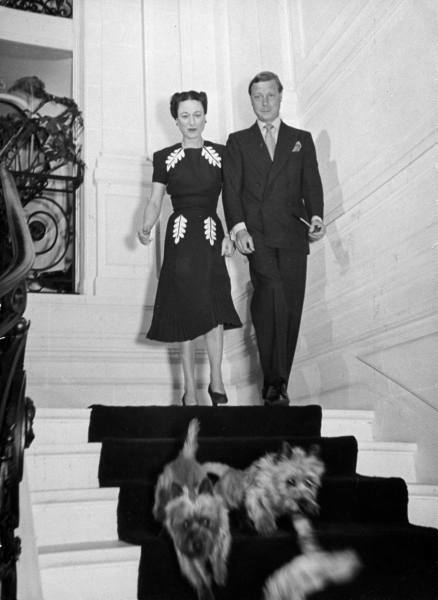 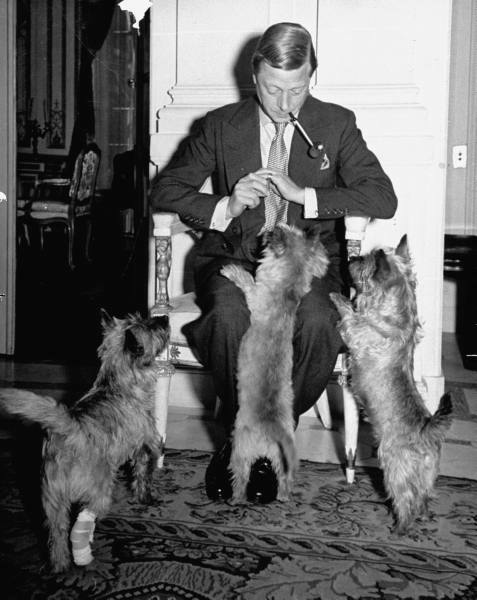 Unfortunately, I didn't find photos of their bedrooms but there is a cute photos of the Duke and Duchess of Windsor with their terriers. You can tell this was early on since they don't have their famous pugs yet.